We are a high quality garage for owners of cars and vans and provide garage services for vehicle owners in Dorset and West Hampshire. Our garage services, including MOTs, are used by vehicle owners from Wimborne, Ferndown, West Moors, Ringwood, West Parley, Broadstone, Verwood and much of Dorset including Poole and Bournemouth. Our Ferndown garage is chosen by many Wimborne residents and businesses, for example, as the garage of choice for both servicing and MOTs. 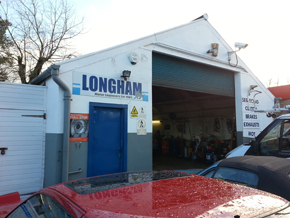 and a full range of other garage services as listed on our home page. You may have noticed that Vehicle Recovery is not listed above. Although we do not carry out vehicle recovery ourselves, vehicle recovery specialists often deliver broken down vehicles to our garage, because we are able to carry out a full range of electrical and mechanical repairs following vehicle breakdown.